Please submit your comments for the #49 and #94 by Monday, September 26, 2011. I noticed that there are bus stops along MetroBus route #56 along Adams being evaluated and nothing posted. Thanks for the information – I’ll pass this on to our planning department. Patrick, our planning department wants you to know that they should be able to take a look at the #56 next week. If it is true, then they will extend the time for the public to comment. Plus MetroBus route #49 needs to be rerouted back onto the Lambert Airport Arriving flights service road like it used to do years ago. Acceess to the Main Terminal via the tunnel is not handicapped accessable and the airport should be held accountable for this. Having the buses be rerouted back onto the Arriving flights service road at the airport is a good way for Metro to get back at them for not having the tunnel to be accessable to people in wheelchairs. Patrick, planning tells me the airport has set up how we operate. You need to send direct your concerns or complaints to the City of St. Louis regarding the airport. Okay why do you keep taking away every bus stop I use? You have got to leave alone the woodson bus stopson Page. Its bad enough I have to walk 20 minutes but I don’t need an added 5 minutes up a hill added to it. And under no circumstances do not touch the bus stop in front of On the Run because that too is important. Its bad enough you guys won’t run 33 on sundays but must you take away all the vital bus stops I use essentially making my walk longer and harder? Your bus stop evaluation “program” isn’t working considering 33 is still late because you guys never bothered to remove stops on Rock Road. Pick on someone else for once. Thanks for your feedback, Julie. We will pass it on to planning. Julie, in response to your comments, our planning department says we do not have the funding to add new service to any bus line, because tax collections are down even with the new tax. Metro is looking at every single MetroBus stop in Missouri and we have found a large number of stops that are exposed on all four sides by traffic. 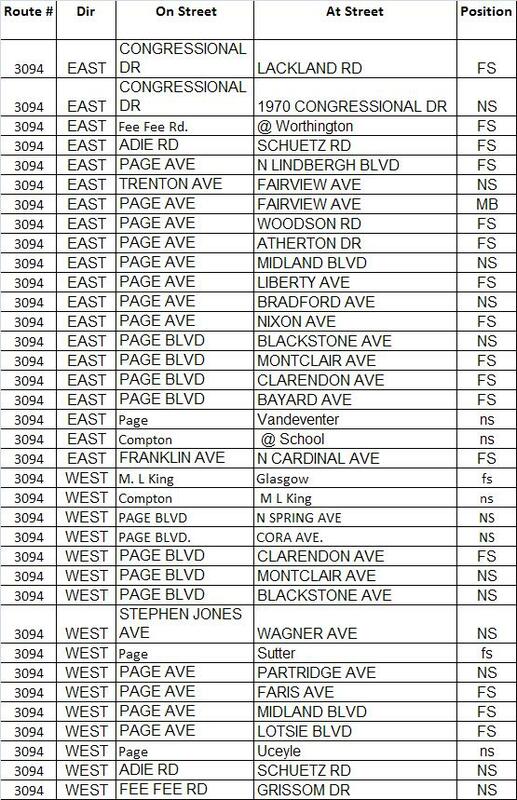 We are moving these stops as we find them and Woodson at Page is one of these areas. Where is the On the Run located? All I want to know is whose bright idea was this to move the bus stop signs. They were fine just where they was (past tense). Move them once, people adjust, move them twice and you loose customers. Did you think about the winter and how far a person have to walk to get to the bus stop? Who do I need to talk to about this upcoming change I am very interested in what is going to happen with the #94 Page? You guys can’t argue about not having enough for a sunday 33 bus when you run 66 6 times a day 5 days a week…a bus that is very unused. Get rid of 66 and make a 33 bus for sunday. On the Run is located at Woodson and Page, its part of Mobil gas station. Just leave the Eastbound and Westbound stops at Page and Woodson alone. I am sick of you guys trying to make my trek harder. If you aren’t going to provide a Sunday bus for 33 then you have no right to take away the bus stop I use on Sundays. Its bad enough the walk is already 20 minutes and will be more during winter, but now you guys are trying to find a way to make it longer? My god I wish I could take my vote back on Prop A because you have not done a single thing to improve Metro. Its nothing but excuses with you guys. Julie, planning has responded to your concerns. They tell me the westbound stop on the west side of Woodson will remain at its current location. Traveling eastbound, your alternative stop will be west of Woodson– approximately the same distance as the current eastbound stop. Unfortunately, you will have to go up a hill as you do now. This eastbound stop is currently in a merge lane– making it unsafe for the buses to stop. Can you clarify what stop you are using on Sundays that you are concerned about? If you would like to talk to someone in planning, I can give you the contact person who oversees Woodson. if you get rid of my bus stop for 94, then you need to find my an alternative because it is wrong of you to add more hell to my walk because of your inability to listen and admit that you are doing everything WRONG! the stop I use going eastbound on 94 is where blockbuster used to be. Its the first stop after crossing woodson. I have to walk for 20 minutes on woodson and really don’t have much energy left to climb up any hills that is why i am fiercely against you guys eliminating that stop because it makers it easier on me. Like I said, if you would just reconsider getting rid of 66 (which in its 6 runs during the day does not get used enough to justify its existence) in favor of making space for a 33 sunday bus, this entire problem would go away. Also, you guys really need to think about removing the westbound Brown/rock road stop on the same side as walgreens. It is getting pretty tiring hearing everyday a passenger argue with a bus driver over the issue with 33 and that particular bus stop. whether its a passenger who uses it and expects 33 to stop, or a passenger on the bus who wants to get off there, the bus always turns onto brown stops on the hill (before getting to the first stop on brown which is really far down the road) and then ends up having to argue with the passenger who demands to know why the driver didn’t stop at the brown/rockroad stop (the bus driver claims its 35’s stop only). Because some will stop there and others won’t it leads to the same old conversation as to whether or not 33 should stop there since it turns at that point. Can you guys please move it to the other side of brown/rock road so that this won’t be a problem anymore? if you are going to do bus stop eliminations you might as well actually look at the ones that should be removed rather than what you are currently doing (which is close to nothing). Thank you for the observation about the #33 and #35 stops, Julie. I’ll get an answer for you shortly! Julie, I heard from planning that the stop westbound is on St Charles Rock Rd. west of Marshall Rd. (which is east of Brown Rd.) This stop is served by the #33 and if Operators are not stopping there, we should report it. Please email me at clsloger AT metrostlouis.org if you run into this problem again, but I will mention it to bus operations. Actually, I’m writing about the bus stop eliminations on the #90 Hampton line. In August the list of proposed bus stop eliminations was posted and several weeks later bus stop signs were removed. Well and good. However, last Friday a bus stop sign at Hampton and Sunshine was removed without any warning. That bus stop is frequently used. On the same day the bus stop sign at Hampton and Robert for the southbound #90 Hampton was *restored*. Not only that, at Hampton and Loughborough (a relatively major cross-street) the bus stop elimination warning was posted on that sign, again for the southbound #90 Hampton bus. What is going on? The Hampton/Loughborough stop is used by many people, including the elderly. With the Hampton/Robert bus stop sign restored, and the Hampton/Sunshine sign eliminated, there is now no stop again until almost Chippewa, definitely over a third of a mile distance. If the Sunshine stop is being eliminated, then a stop at the next block Jamieson should be put up. Please respond. John, I’ve contacted the planning department and will get you an answer as soon as I find out. Thanks! Julie, I know you are upset about the hill on Woodson. Years ago, many streets had streetcars running on them. Many of them ran during the 1940s when World War II was going on and everybody was riding. Now if this was Toronto, you would see many, many, stops and the streetcars stop just about any where you want them to because they have stop signs painted on the doors. So when the doors open on the streetcars, the motorists have to stop. But we don’t have that luxury here in St. Louis. Metro should paint some on both the front door and the lift door on Call-a-Ride as some of the Call-a-Ride destinations are on the driver’s side of the van and on one-way streets. Now if you have a physical condition that limits you on how far you can walk, then you should sign up for Call-a-Ride. And with your Metro pass, your fare would be no more than $2.65. On Call-a-Ride, you get high-back seats, and after you are seated and belted in after you pay your fare, they turn the interior lights off. And in a way, it’s like riding Greyhound. Thank you for checking on the #90 bus stop signs. Actually, I talked to Natalie on Tuesday and she explained the reasoning for the changes. However, I didn’t realize until later that day that the to-be-restored bus stop at the hardware store north of Loughborough is practically a block north of the Loughborough intersection. Can’t the bus stop sign be placed immediately north of Loughborough by the mattress stop on the corner? I understand the safety reason of removing the bus stop sign south of Loughborough at the filling station but it was closer to the intersection. Southbound passengers intending to get off at Loughborough may pass the proposed bus stop before realizing they missed it. Would you please share this concern with Natalie? Thanks. Also, I am still concerned about the removal of the Sunshine bus stop and restoring the north Robert bus stop, because the Robert stop is two blocks from Jamieson. There is no #90 bus stop at Jamieson, as well as no bus service on Jamieson from Hampton to Chippewa (but that’s another story). However, Natalie said if she gets more complaints about the latest Hampton bus stop changes, Metro may re-evaluate the sign placements, which seems fair enough. John, I will certainly pass this information on to Natalie, and relay her response as well. I suppose the Sunshine and Robert bus stops will be a wait and see, and if you have any observations as the changes take hold along Hampton please let us know. Marsha, I will let Planning know about your request and find out what we can do. Thanks for your feedback!